SU16 is my current favorite 223 — enough that it is my house gun. Mine is very heavily modified with Keltec and Red Lion parts, equipped with light/laser, red dot and a sound suppressor. The full-up weight is probably 50% more than this base model, folding receiver sport-utility carbine. But in its original form, SU16 is light, has a very long sight radius, folds up for storage with two 10rd or one 30rd magazine in the stock. And it’s a clean-running piston design. This entry was posted in rifle and tagged 223, 300BLK, folding, keltec, light, SU16, weight. Bookmark the permalink. I wanted one a while ago, but could never find one close. Made a different choice since then, but it’s a good looking little carbine. But how rugged/reliable is it? I’d love to have a rifle or carbine that’s as tough as an AK but fires .223 rounds. In my experience, both reliable and durable — also comfortable to fire suppressed due to the enclosed receiver back. I am under the impression that their gas system is similar to the AK which may give it an edge in reliability. Correct me if I am wrong. Available in 300 BLK? when did this happen? “When did this happen?” – Since its a Kel-Tec, never. I really hate to be hopping on the bandwagon ragging on Kel-Tec. I want to buy their products. A lot of that desire has been driven by Olegs photography and reviews. The problem is I *can’t* buy their products. This isn’t the same “can’t buy” like an AMG Mercedes, this is “can’t buy” because these are good products, with a sane MSRP, that aren’t on dealer shelves. It’s even more frustrating that Kel-Tec doesn’t seem to say anything about it! A simple “We hear you and shipped 1000 KSGs last month” or “Business is booming and we’re adding a 3rd shift” or “We’re a small company and just can’t keep up with demand”. I commend and admire Kel-Tec for having all of their new products sold out, but they could be doing better with that success! The SU16 is very lightweight and handy, in most all way’s a fine product. As to it’s long term reliability and service life it would be best not to compair it to an AR15 type weapon. Instead think along the lines of a Nylon 66, etc. 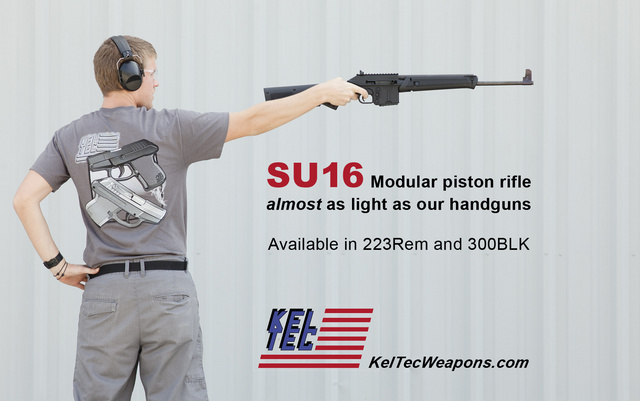 I consider the SU16 to be a better purchase than the Sub2000 but cannot offer any input on other KelTec long guns. They are a fine company to do business with and fully stand behind their products. Here’s the nub of it: Kel-Tec CNC broke the mold for low-volume firearms manufacturers. Until Kel-Tec, small manufacturers always had very limited lines. Coonan is a good example of such a factory. Kel-Tec never stopped innovating, and now has as many models out as some manufacturers 100 times their size. As their products’ fame spreads, the availability issue will only get worse, so get over it, and get in line. Anything worth having is worth waiting for.